I can't believe this, the last day of the challenge! I decided to recreate this manicure done by The Polish Playground. Hers was Finding Nemo nail art, mine got a little more abstract. Doesn't show much on the pictures but each nail is painted a different color to get the ombre effect. never have tried on my own. So thank you Craftynail, Brijit and Eeeek Nail Polish for creating this challenge. Having car troubles today made my day not a very happy one. So in extreme frustration and tiredness I did my nails. though I favor manga over "western" comic books I've read my share of them. Among my favorites are also Fables, The League of Extraordinary Gentlemen, Marvel 1620, Preacher and Sandman. Unnamed black in a skull shaped bottle. What is your favorite comic book? I love dresses, if I lived somewhere that wouldn't have cold winters and weather that didn't change by the hour in summertime I would only wear dresses, I wear dresses a lot but often enough I dress for warmth and comfort. So today's theme is fashion and I decided to take inspiration from this dress by Eva Franco. It's so cute and perfect for summer and I've drooled all over my keyboard looking at it. I can't believe that there are only 2 days left!! I think it's safe to say that my all time favorite TV show is Doctor Who! Love everything about it, the stories, the characters, the plots. These are not perfect, the stones are a little on the big side and few of them almost didn't fit on my nail, they are so short, but I like them anyway. I'm not sure if I pulled it of or this is a total disaster. So here is strawberry ice cream with caramel sauce. Really short post this time. Happy Friday! I haven't been home today so this was done in a hurry and is a really simple one. take my inspiration from them. So in the simplest way, here are the house colors. Ravenclaw - Maybelline Color Show - Ocean Blue, Barielle - Gelt Me To The Party. Gryffindor - OPI - Need Sunglasses?, L.A. Girl Fruity - Zesty Citrus, Sally Hansen - Cherry Red. Slytherin - Make Up Store - Paula, Gosh - Silver. Hufflepuff - H&M - Lime, Unnamed black polish in skull bottle. This was done in such a hurry so I could post this on time. I decided that because we where watching the movies I should read the books again, on book 4 now. Phew, I made it before midnight!! Yay me!! I decided to try out this tutorial from Pack A Punch Polish. Green finger: Essie - Mint Candy Apple, E.L.F. - Teal Blue, Alessandro Ice Cream Bar - Lime Vanilla, Maybelline Color Show - Urban Turquoise. Yellow finger: E.L.F. - Yellow, BK Polish nr. 02, OPI - Need Sunglasses?, Alessandro - Yummy Yellow. Pink finger: OPI - Mod About You, Nabi - Neon Light Pink, Sally Hansen Xtreme wear - Coral Reef, Unnamed pink in a skull shaped bottle. Purple finger: Essie - Lilacism, Essie - Play Date, Depend nr. 202, Unnamed Alessandro. Thumb: Alessandro - Cashmere Touch, H&M - Clay, H&M - Turqouise. I got too impatient with the pink dots and put a topcoat on before it had dried, hence the smearing. Working on my glitter gradient skills, it's harder than it looks to make a gradient only with glitter. Tiger Stripes, hear me roar!! This is my first time trying this, I had a little problem with smearing when I put the topcoat on. Today's manicure is super simple, I don't have any stamping plates so I decided to use nail art stencils I got from a Kiss package. Super super easy because I'm lazy today. I decided to use flash when I took these to show off the beautiful shimmer in the Bright Lights - Big color. Today's theme for the OMD Challenge Giveaway is 3D. I thought I would use a mint green for this manicure as a tribute to the 13 year old Talia Joy who passed away this week after a lifelong battle with two types of cancer, I didn't know who she was until a few days ago, she was an incredible talented make up and nail artist and her videos on youtube are really fun. I was thinking of a meadow when I did this and I have to say I'm extremely happy with how this turned out. I'm still at home with the flu, which has given me a chance to watch, for the millionth time, Friends, Family Guy, Torchwood, read Harry Potter and watch all my DVD's that have the word "Day" it the title. My cats have been really helpful fighting over who should get to lay in my lap. But on to the challenge. Well, not as delicate as I wanted it to be but this is my first attempt at a lace pattern. 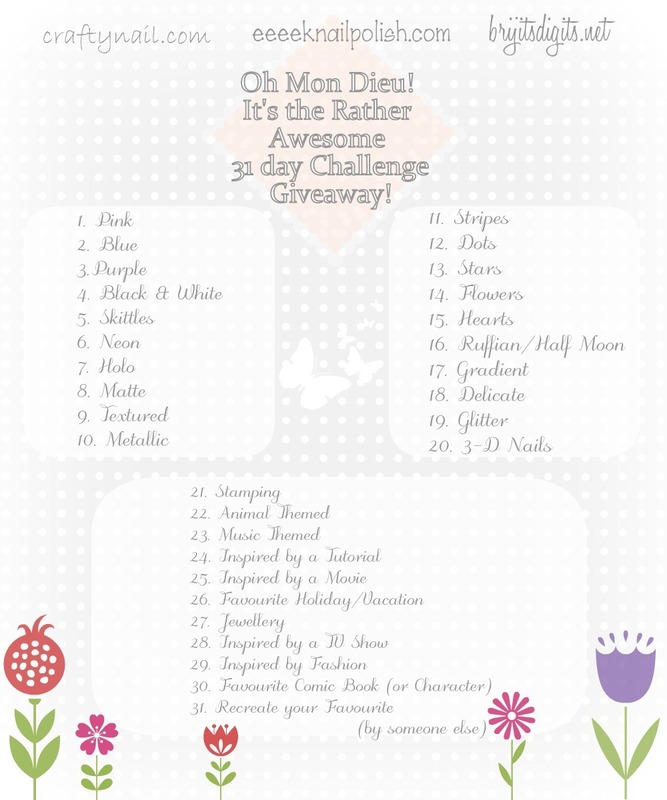 I can't believe I'm still on track with this challenge!